All your emails and contacts under one roof. 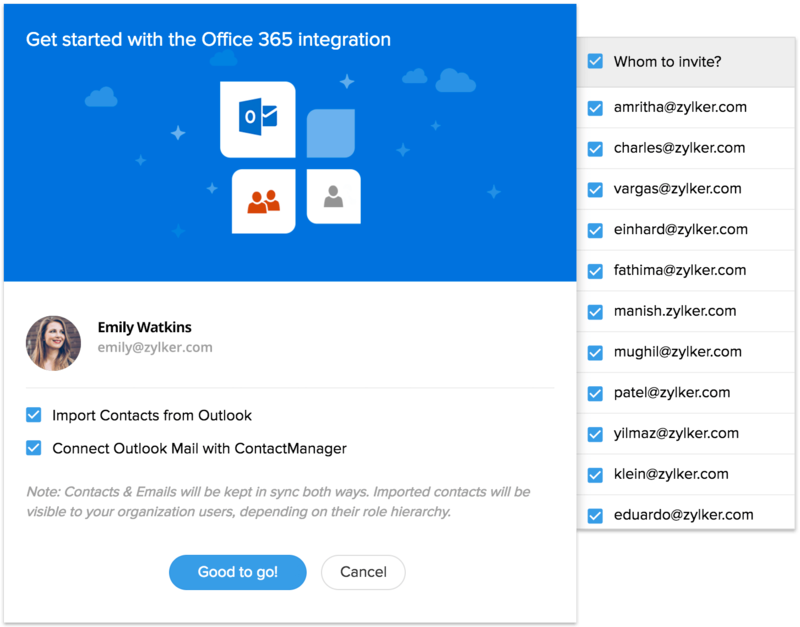 Integrate your Microsoft Outlook.com account with Zoho ContactManager to manage contacts better and foster team productivity. Once you complete the integration, all contacts in your Outlook.com account, and their notes, will be imported to Zoho ContactManager. 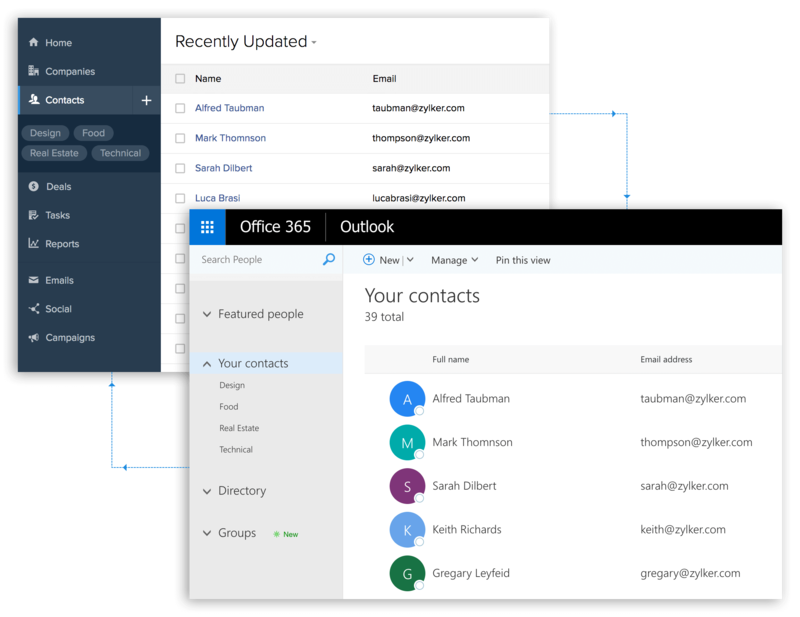 In addition, they will be synced: If you create a new contact in ContactManager, it will be updated in Outlook.com/Office 365—and vice versa—in real time. Keep track of emails to and from customers without hassle. We know you're tired of scrolling down endlessly to find that old email you received a while back. 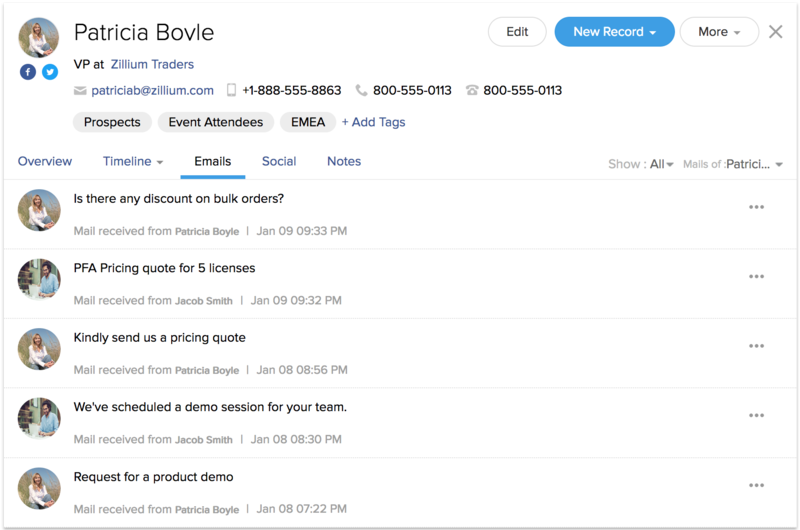 The Outlook integration imports contacts from Outlook.com to Zoho ContactManager, and maps each contact with their respective emails. While looking into a contact's records in Zoho ContactManager, go into the "Emails" sub-tab, and you'll be presented with every email correspondence you've had with that particular contact. 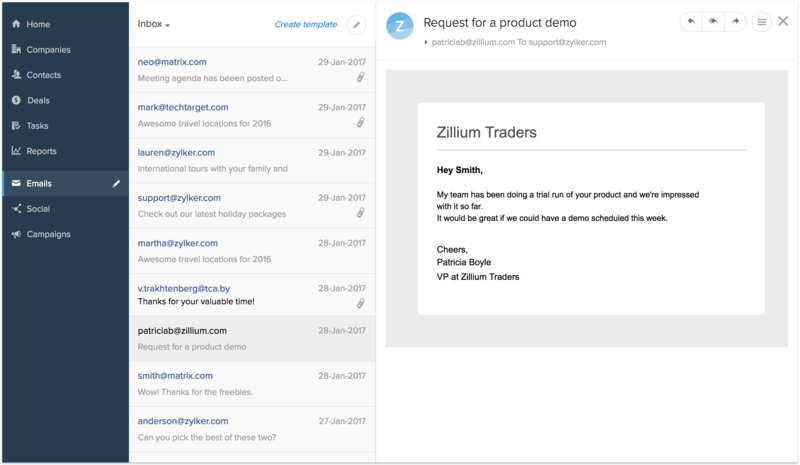 You can even configure the inbox of Zoho ContactManager so that any new email gets converted into a contact. The "Emails" module becomes your new inbox, displaying all your Outlook.com mails for you to peruse at your convenience. Import Office 365 users, collaborate better, and improve data security. Add all of your team from Office 365 as users in Zoho ContactManager so collaboration is easier. The integration also gives you the ability to prevent users from accessing specific data based on their roles. Attach OneDrive files in notes and emails. Do you have important files and invoices stored on OneDrive? If yes, then you can attach those files in your notes to team members, or in emails to customers with the CloudPicker. Access multiple cloud storage solutions, including Microsoft OneDrive, and attach the files of your choice, without waiting to upload from your computer.